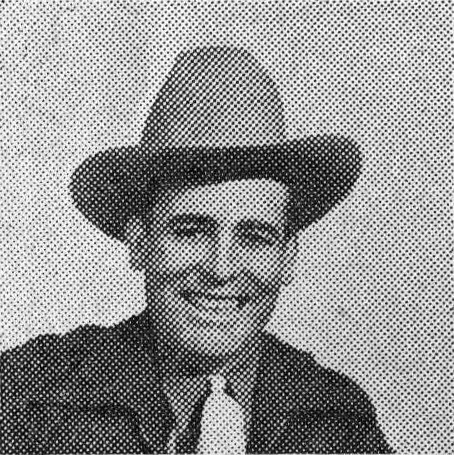 Bob Wills, pictured in the 1940 Okeh Country Dance and Folk catalog. Fresh from Cain’s Dance Academy in Tulsa, Oklahoma, it is Old Time Blues’ pleasure to bring you a program with Bob Wills and his famous Texas Playboys! 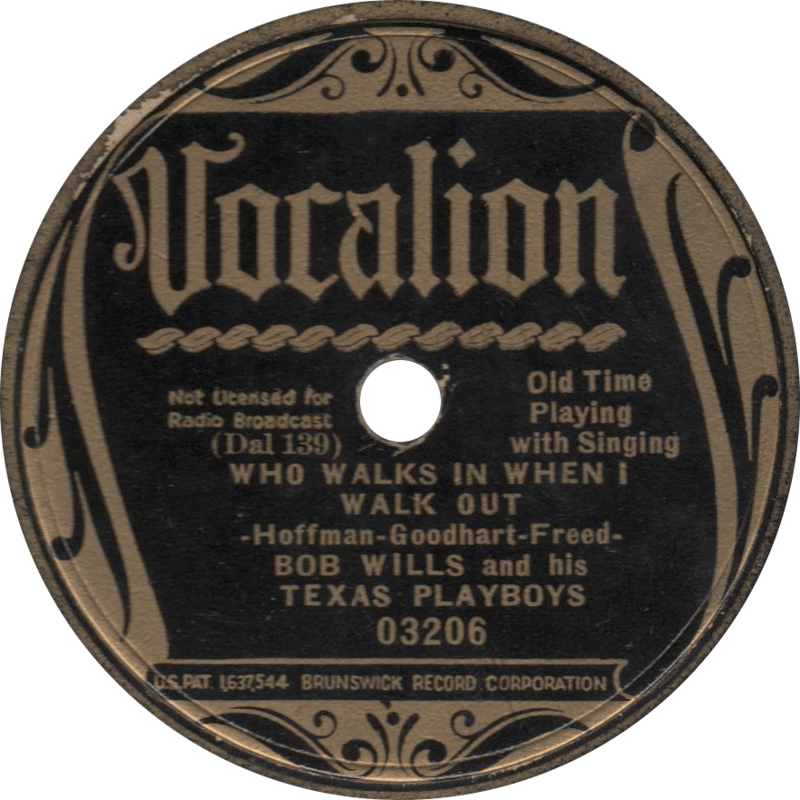 Bob Wills (then known as Jim Rob) made his first recordings for Brunswick/Vocalion in 1929, a pair of fiddle solos accompanied by guitarist Herman Arnspiger, but none were released and remain unheard. It would be three years before Wills recorded again, this time with Milton Brown as a member of the original Light Crust Doughboys. Still that lone 1932 session only yielded two recordings which didn’t sell too well under the Depression conditions, and both Wills and Brown parted ways with the Doughboys soon after. It wouldn’t be for another three years that Wills began his recording career in earnest. By that time, he had taken his fiddle band to Tulsa to make a name for himself as leader of the “Texas Playboys” at Cain’s Ballroom, and along the way had added a horn section and drums to the ensemble. When the American Record Corporation came to Dallas in 1935, the Playboys returned to Texas. On September 23, 1935, Wills and his Texas Playboys recorded eight titles, starting with “Osage Stomp”, borrowing from the Memphis Jug Band’s “Memphis Shakedown” and “Rukus Juice and Chittlin'”, followed by twelve more the following day. On the third day, Wills returned to the studio solo to cut four fiddle solos backed on guitar by Sleepy Johnson. This time, as the record industry was beginning to recover with the beginning of the swing era, his records sold many more copies, and the Texas Playboys traveled to Chicago almost exactly one year later for another three sessions. producing thirty-one more sides, including the famous “Steel Guitar Rag”. Soon the Playboys skyrocketed to national fame, drawing larger crowds than Benny Goodman or Tommy Dorsey with hits like “New San Antonio Rose”, and making a string of successful motion picture appearances, ultimately winning him the title “King of Western Swing” (that Spade Cooley never deserved it if you ask me). 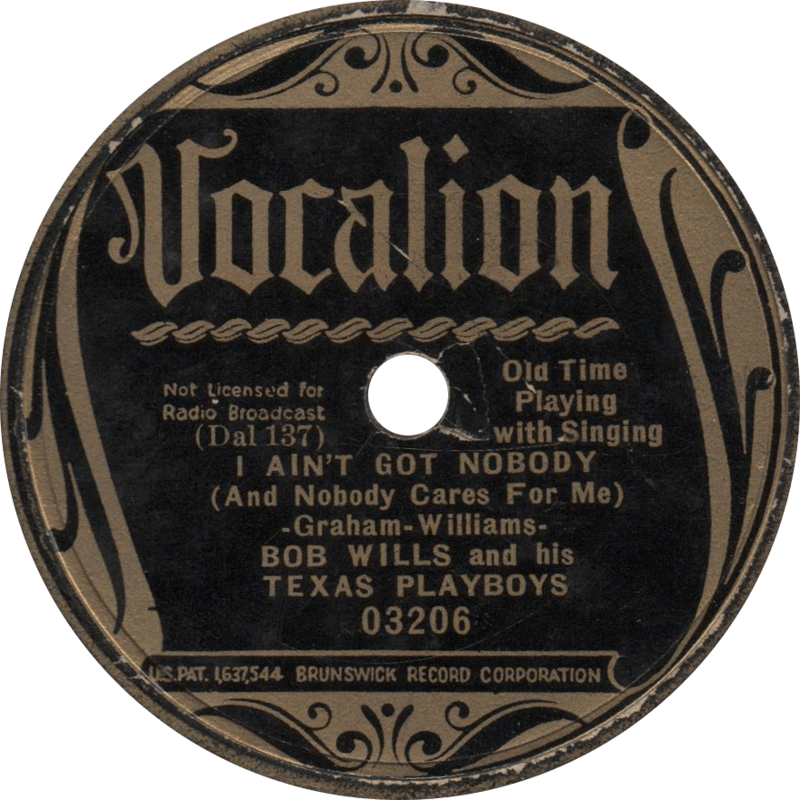 Vocalion 03139 and 03206 were recorded in Dallas, Texas on September 24, 1935, the second day of the Texas Playboys’ first session. In the band are Bob Wills, Jesse Ashlock, and Art Haynes on fiddles, Robert “Zeb” McNally on alto saxophone, Sleepy Johnson and Herman Arnspiger on guitars, Leon McAuliffe on steel guitar and guitar, Johnnie Lee Wills on tenor banjo, Al Stricklin on piano, Thomas “Son” Lansford on string bass, and William “Smokey” Dacus on drums. To start us out, the Playboys swing a hot instrumental: “Black and Blue Rag”, with Bob addressing his Playboys by name as they take their instrumental solos. 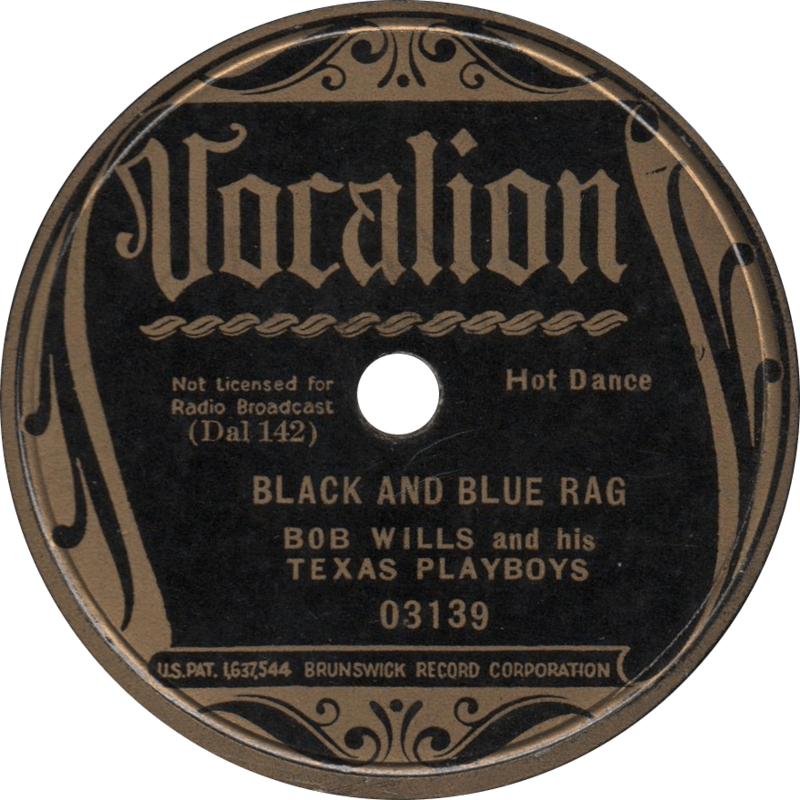 Black and Blue Rag, recorded September 24, 1935 by Bob Wills and his Texas Playboys. 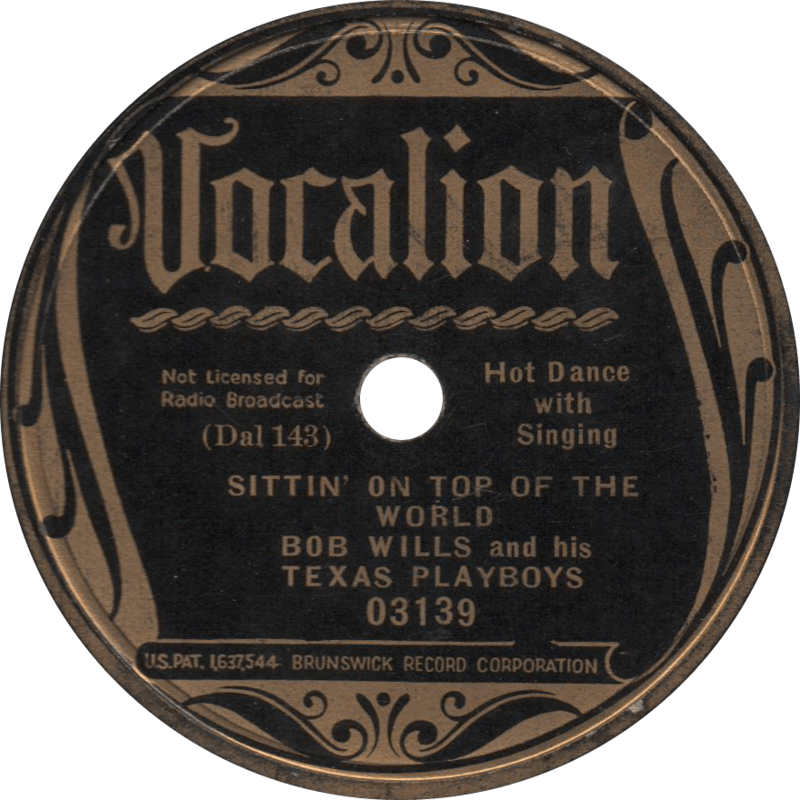 On the back of 03139, Bob sings the vocal himself on the Mississippi Sheiks’ blues standard “Sittin’ On Top of the World”. Sittin’ On Top of the World, recorded September 24, 1935 by Bob Wills and his Texas Playboys. Tommy Duncan joins the show on “I Ain’t Got Nobody”, giving a wild Emmett Miller-style yodeling performance. I Ain’t Got Nobody, recorded September 24, 1935 by Bob Wills and his Texas Playboys. Who Walks in When I Walk Out, recorded September 24, 1935 by Bob Wills and his Texas Playboys.